I admit that I’m not a huge Kat Von D fan and that I haven’t really kept up with much of what she’s been doing with her life and career. I don’t have anything personal against her – although let’s face it, her reality TV series LA Ink went from vaguely interesting in its early seasons to a staged, over the top Hollywood nightmare by the end of its four year run. I think she’s a talented tattoo artist, but the Hollywood glam and glitz kind of overshadowed the tattooing and it all just made me completely lose interest in her as a tattooist. That being said, she did do a lot to get tattoo into the mainstream, so take from that what you will. At any rate, despite what you or I may think of Kat Von D, she has had some rough times in the last few years. The disintegration of her terrible reality TV show was no loss, but her house burned down in 2010 and her cat died in the fire, which is a tough thing for anyone to go through. 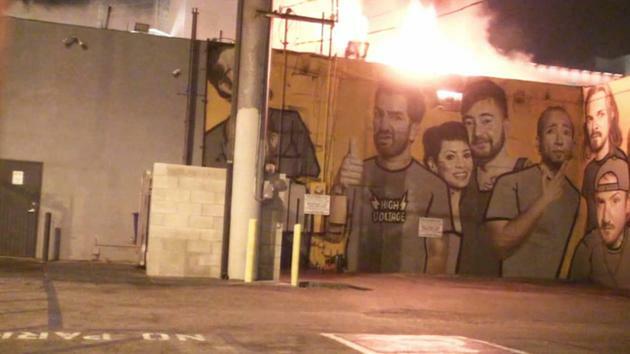 Most recently though, a fire blazed through the West Hollywood strip mall where her famed High Voltage Tattoo studio is located, causing damage to the shop itself. About 50 firefighters battled the blaze, which was reported just after 4 a.m. in the 1200 block of North La Brea Avenue, according to Los Angeles County Fire Capt. Brian Jordan. Firefighters removed valuable items from the tattoo shop and neighboring building, which was also damaged in the fire. Bad luck for Kat and the other artists, as I’m sure that High Voltage is more than just a place of work for all of them. The worst part about all this is that the media was on site to record Kat’s reactions to the fire. Obviously any normal person would be stressed and upset over something like this happening. Unfortunately, the media thrives on finding people – especially celebrities – stressed and upset about anything. Kat asked them to leave her alone and got frustrated and knocked the hat off of a camera woman who refused to comply with her wishes. The end result is that the media turned around and produced sensationalist headlines like “Kat Von D Flips Out On Reporters After Tattoo Shop Fire” and “Kat Von D Attacks Reporters After Tattoo Shop Fire” and “Kat Von D Assaults Journalists After Tattoo Retailer Fire”. Give me a break. Please. Anyone who has seen the video can clearly see that no attack took place, no assault took place. She asked them to leave, swore at them and knocked the baseball cap off a camera woman’s head. That was all. Second of all, referring to anyone at TMZ as a “journalist” is more than a bit of a stretch. For what it’s worth, I hope that the damage to High Voltage wasn’t too bad and that Kat and her crew are able to get back to work as quickly as possible. I hate sensationalist media who distort facts, so I just felt that I wanted to do my tiny part to step up and say that Kat was justified in being distraught. Her reaction to a fire and being pestered by hack paparazzi wasn’t shocking, nor was it assault or an attack.